Creme Anglaise (English Cream) is the French translation for custard sauce. There are two types of custard; cooked (stirred) and baked. The difference being that 'baked' custards contain whole eggs and are cooked 'in' a water bath 'in' the oven (think creme brulee). In contrast, the 'cooked' or 'stirred' custard sauce (presented here) contains only egg yolks and is cooked 'on' the stove, oftentimes 'over' a water bath. The end result is a nice rich and smooth textured sauce that can be served, warm or cold, with cakes, pies, puddings, or fruit and is ideal for plated desserts. Cooked custards can vary in richness and consistency, although all are pourable. The standard proportion for creme anglaise is 5 large egg yolks for every 2 cups of milk. Extra yolks can be added and light cream (or half and half) can be substituted for the milk to make a richer sauce. The amount of sugar can vary, depending on sweetness desired, but the standard proportion is 1/4 cup (50 grams) of granulated white sugar. Traditionally a vanilla bean or pure vanilla extract is added to the sauce although other flavored extracts can be used, as can zests, alcohol, fruit purees, or even melted chocolate. Now, cooked custards can also be used as a base for other desserts. If the custard is thickened with starch (flour/cornstarch) it becomes a pastry cream and its uses extend to filling tarts, cakes, cream puffs, and eclairs. Its most famous use is in the English Trifle. If some of the milk is replaced with heavy cream the custard sauce becomes rich and smooth and is used as a base for ice creams. Take this custard one step further and add gelatin and whipped cream to it and you now have Bavarian Cream. A commercial custard powder is available that consists of cornstarch (cornflour) and artificial flavors (and sometimes sugar). It was invented by Alfred Bird in Birmingham England in 1837. Some people prefer this sauce because it is much easier to make and they don't have to be concerned with the eggs curdling. 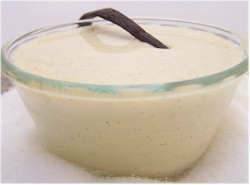 Creme Anglaise: Have a fine medium-sized strainer and bowl ready near the stove. In a small saucepan heat the cream and vanilla bean (if using) just to the boiling point. Remove from heat and whisk a few tablespoons of the cream into the yolk mixture. Then, gradually add the remaining cream, whisking constantly. Pour this mixture into a medium sized saucepan and, over medium heat, gently heat the mixture to just below the boiling point (170 - 175 degrees F) (77 - 80 degrees C). You will notice that steam will begin to appear and the mixture will be slightly thicker than heavy cream. Do not boil or the eggs will curdle. Check to see if it is the right consistency by holding a wooden spoon sideways that is covered with the custard and run your finger along the back of the spoon. If the streak remains without the cream running down through the streak, it is ready. The creme anglaise can be refrigerated covered with plastic wrap for a couple of days. Note: If sauce was overheated and curdling occurs, pour instantly into a blender and process until smooth before straining. If necessary, add a little heavy cream to the mixture before blending. Makes about 2 cups (480 ml). Preparation time 20 minutes.